The new Corsair will replace the aging Lincoln MKC crossover. 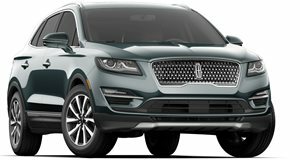 After launching the all-new Aviator, Lincoln is gearing up to replace its aging MKC crossover with a brand new model that will serve as the brand's smallest SUV. As expected, the automaker has confirmed the new model will be called the Corsair and will debut at the New York Auto Show on April 17. Ahead of its debut, Lincoln has released a teaser video giving us a first look at its upcoming compact crossover. From the shadowy silhouette, we can see the Corsair will have a slightly sloped roofline and a roof-mounted spoiler. "With the continued strength of our SUVs - from the record-breaking sales of Navigator, strong customer response to the 2019 Nautilus and the arrival of the all-new Aviator in the summer, the Corsair will further strengthen Lincoln’s lineup,” Lincoln wrote. 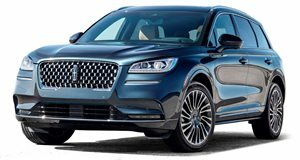 Originally, Lincoln was expected to show the MKC’s successor for the 2021 model year, but booming SUV and crossover sales has forced the luxury automaker to reveal it sooner. The timing certainly seems right for the MKC to get a much-needed update. Lincoln hasn’t released any more information about the Corsair, but a recent report suggests it will be offered with three powertrain options. The base model will reportedly use Ford’s 2.0-liter EcoBoost four-cylinder engine producing 245 horsepower, while a larger 2.3-liter engine will offer 285 hp. Both engines will carry over from the MKC and will be mated to an automatic transmission. Front-wheel-drive or all-wheel-drive will also be available. A third plug-in hybrid drivetrain could also be offered. The Corsair plug-in is expected to use the same 2.5-liter four-cylinder Duratec motor currently found in the Ford Fusion Energi that produces 175 hp, but electric assist will increase the output. The driving range also remains a mystery, but the Fusion Energi plug-in was upgraded to 25 miles in 2019. These details will be confirmed on April 17 when the new Lincoln Corsair makes its debut.